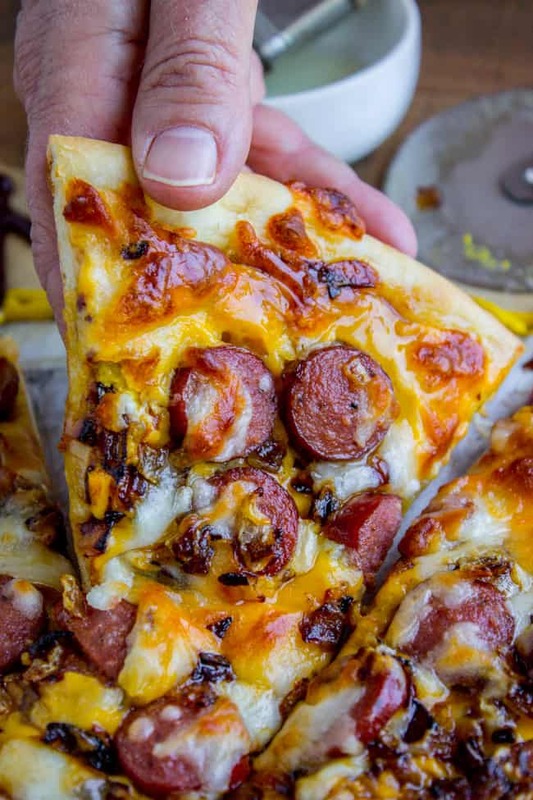 Hot dog pizza?? HEAR ME OUT, GUYS. What is a hot dog? Bread, hot dog, toppings. What is this pizza? Bread, hot dog, toppings. It works. I promise. Now you have a plan for the leftover bun-less hot dogs from your 4th of July barbecue! Charlotte is a ridiculously amazing artist. 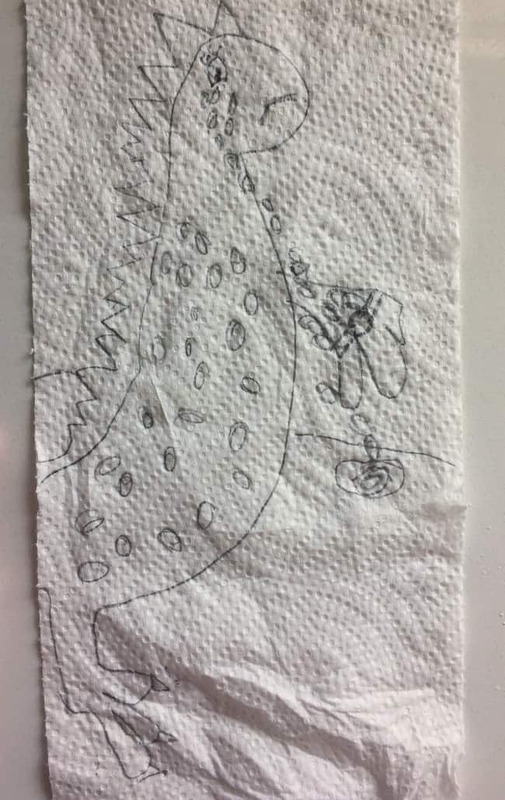 She’s 6, and can produce more accurate drawings than I can as a kind-of-mature adult. 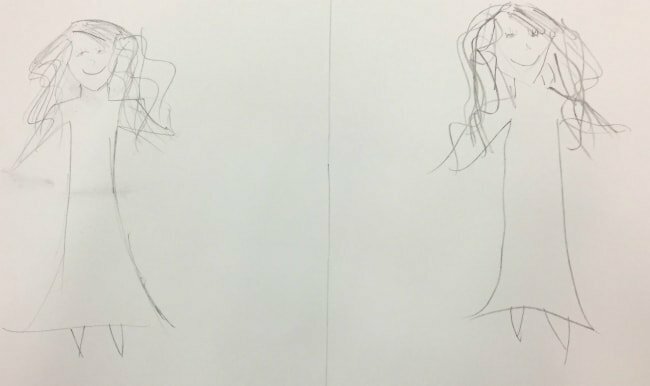 Last Sunday at church for an object lesson, the teacher told us to draw a self-portrait of ourselves, and then to draw the same picture with our non-dominant hand. Here’s my picture. Can you even tell which one is my dominant hand?? They look basically the same to me, a testament to the fact that even with my right hand I still can’t get beyond a glorified stick figure. Not only is it a pretty amazing drawing for a 6 year old, but it also shows more depth of emotion than I could ever pull off. Sad dragon eyes?? I couldn’t even manage recognizable appendages on my drawing. I think I’ve officially become that mom who brags about her kid’s artwork to people who do not care at all. Mom, I really am turning into you. Sorry, internet. 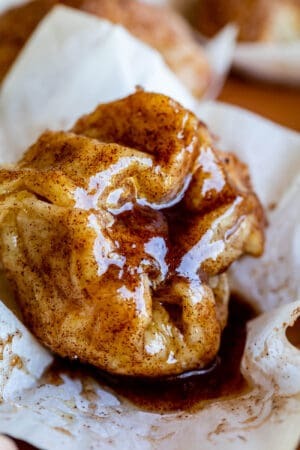 Kris is the source of some of the greatest recipes on this blog, like this Beef Barley Soup, and these One Hour Cinnamon Rolls. So when Kris calls me up to tell me about a recipe, I listen. 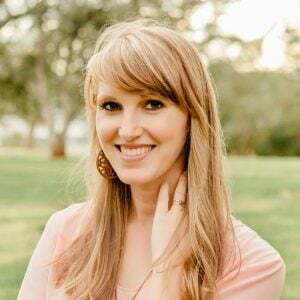 In her email describing the pizza (that I made her write after the call, and which she titled, “My Genius Leftover Hot Dog and Hamburger Pizza”) Kris referenced her pizza peel. I always called that a pizza-transfer-er thing, how bout you? Pizza peel makes me feel like we’re going for a spa day in which we peel pizza off our faces to get baby soft skin…no? Just me? 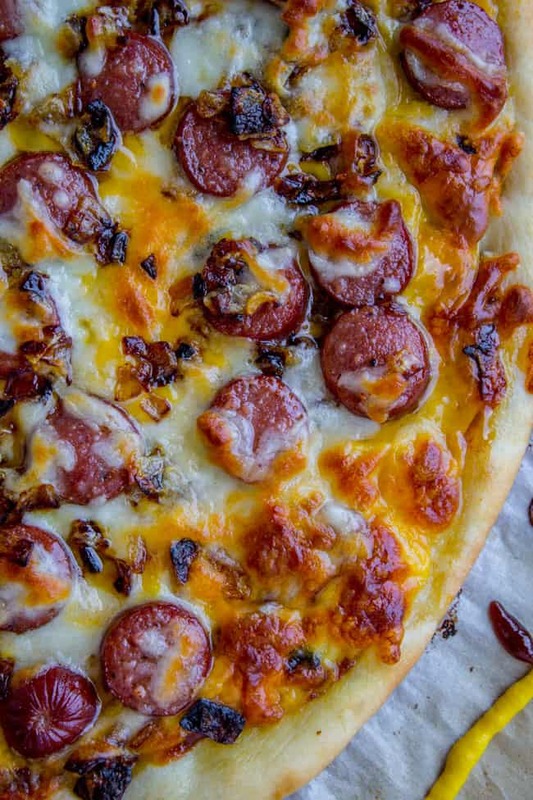 Do you guys ever par bake your pizza crust? No more soggy crust. 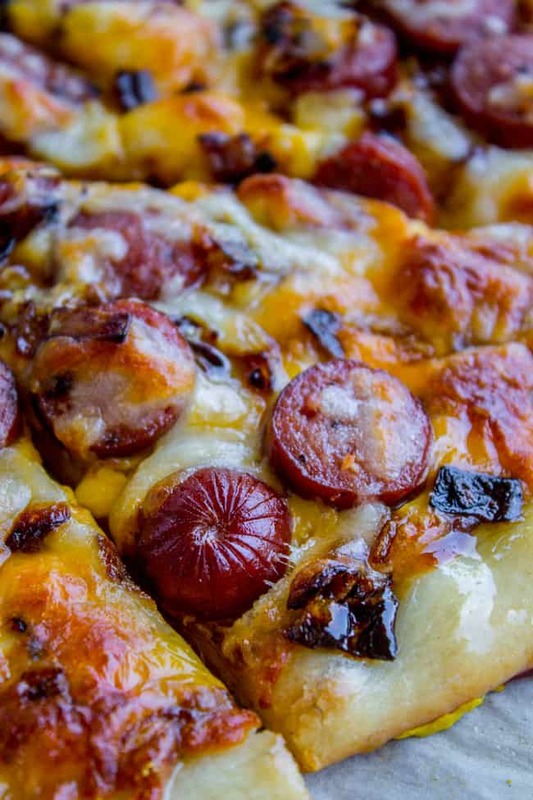 Anyway, Kris’ genius pizza (this makes me laugh every time) is: crust, mustard, BBQ sauce (or ketchup), American cheese, hot dogs, caramelized onions, mozzarella. It is SO delicious you guys. I already had a healthy respect for hot dogs but now I’m just obsessed. 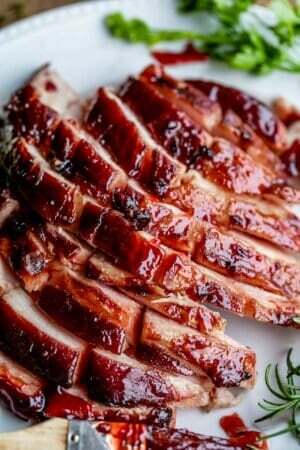 You could also top your pizza with leftover brats or whatever else you happen to have barbecued yesterday. 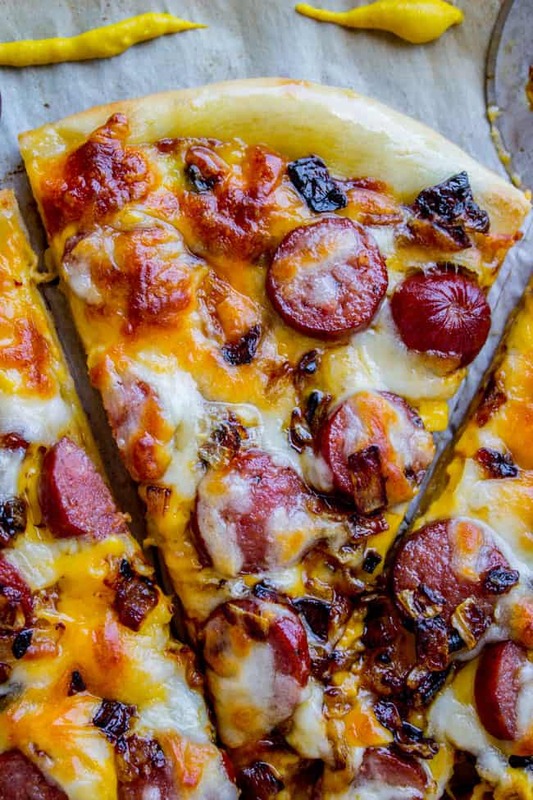 Hot dog pizza?? HEAR ME OUT, GUYS. What is a hot dog? Bread, hot dog, toppings. What is this pizza? Bread, hot dog, toppings. It works. I promise. Preheat your oven to 450 degrees F. If you have a pizza stone, put it in the oven now. Heat a frying pan over medium heat. 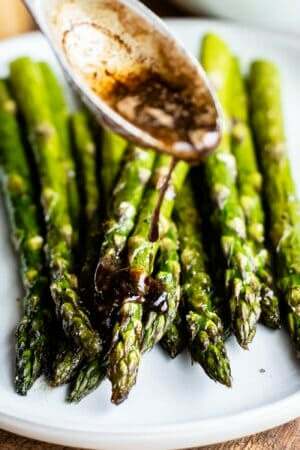 When the pan is hot, add the olive oil. When it shimmers add the onions and stir occasionally for about 10-15 minutes, until they are browned and caramelized, and okay maybe a little burned. Meanwhile, lay out a square of parchment paper. Dust with a bit of flower. Roll out the pizza dough into a 13-14 inch circle. Use your fingers to build up the edges a little bit so that you have a decent crust. 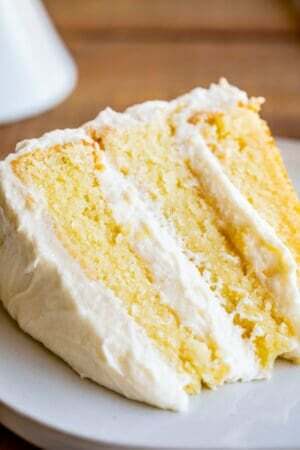 Drizzle the dough with about a tablespoon of olive oil. Use a brush or your fingers to moisten the dough completely, especially the crust. Transfer the dough to the oven to par bake. If you are using a baking sheet or pizza pan, transfer the dough to the pan at this point, then place it in the oven. If you are using a pizza stone, use a flat-edged baking sheet or a pizza peel to slide the parchment paper (with the dough on top) onto your pizza stone. Bake at 450 for 1 minute. Remove from the oven. 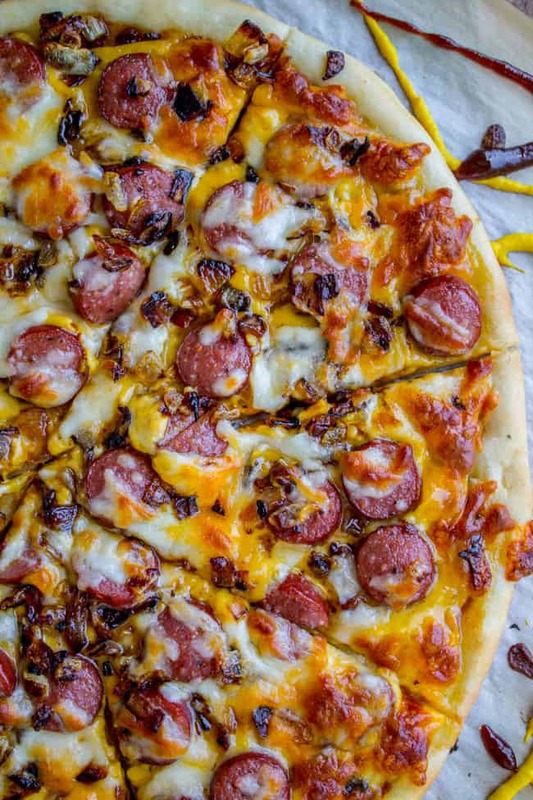 Squirt the half-baked crust with plenty of mustard and BBQ sauce. Use the back of a spoon to spread it around. Top with the slices of cheese, chopped hot dog, onions, and then sprinkle with mozzarella cheese. If you like sauerkraut, add that on top so that it gets crispy in the oven. Return the pizza to the oven and bake for another 10-12 minutes, until the cheese is getting brown spots on the top. More summer food to love! 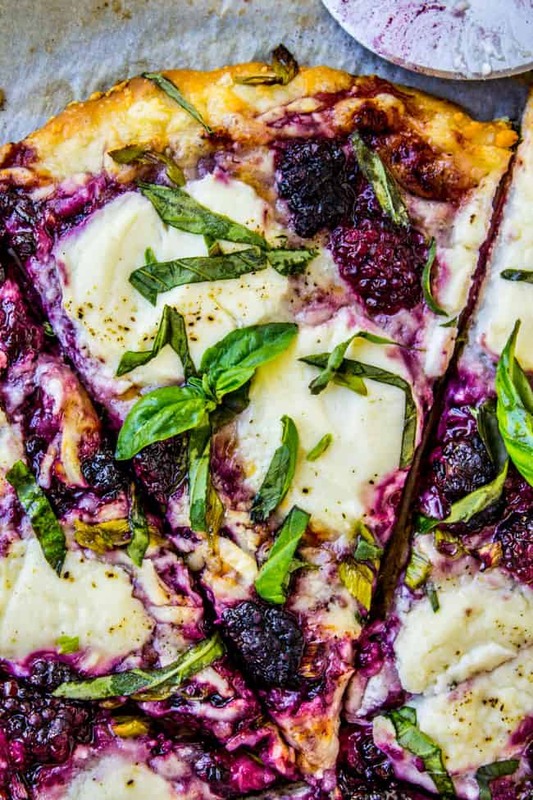 Blackberry Ricotta Pizza with Basil << this is such a great summer pizza! 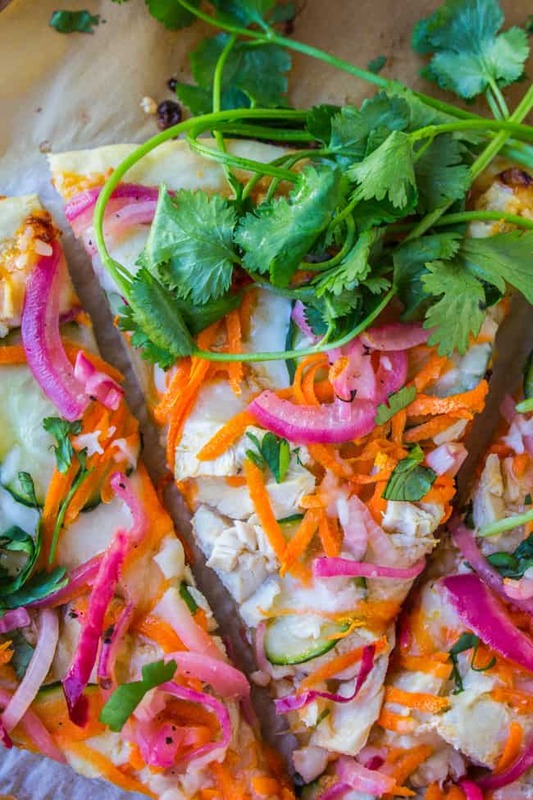 Thai Pizza with Zucchini and Pickled Onions << for some reason people forget about this pizza. But I LOVE it. More pizza and hot dogs! Pizza Dogs from Taste and Tell << opposite of this recipe!! « Previous PostCherry Pie for 4th of July! We’re definitely having this tonight. Two of my favorites combined. I cannot imagine it to get any better than this. Also, I am looking forward to the hamburger leftover pizza. :) Thanks for this awesome recipe for leftover hotdogs. Yay! How did it go Sheila? I hope you all loved it as much as we did! I need to work on that hamburger pizza next! So glad you tried it! It’s good, yeah? Really, there isn’t much that isn’t good on a pizza. It’s always a save for leftobers, in my opinion!